Bees have always been fascinating to me, with their interesting social colonies, their ability to keep our agricultural systems going through pollination, their cute fuzzy bodies, and—of course—their delicious honey. And as we learn more about them, the more remarkable and complex they become, and the more we discover just how much our ecosystem relies on their hard work. This informative documentary delves into the long relationship humans have had with honeybees: imagery of bees has been drawn on prehistoric cave walls, ancient Egyptian pharaohs were entombed with honey pots, and in many cases bees were seen as religious symbols. While celebrating our symbiotic relationship through interviews with a wide variety of beekeepers, the documentary doesn’t shy away from showing the various ways that humans may have interfered too much with nature, such as using pesticides that hurt bees and other vital pollinators while contaminating their honey, planting just one crop over a wide area (this leads to increased blights and prevents pollinators from getting nutrients), stressing the bees by transporting them thousands of miles on trucks, using too many antibiotics, and limiting genetic diversity by artificially inseminating queen bees. 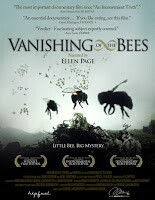 Narrated by Ellen Page, this profoundly disturbing documentary focuses on the alarming phenomenon known as Colony Collapse Disorder—what seems like a worldwide plague that causes entire colonies of bees to suddenly disappear. In just a few years, millions of beehives have been lost in this way, costing the economy billions of dollars in the loss of these crucial pollinators. Speaking with various beekeepers, both those at huge industrialized companies and smaller organic hobby farms, the filmmakers investigate many possible causes of this disorder and suggest ways to help bees overcome it. This gorgeously-filmed documentary follows several migratory beekeepers who have brought their boxes of beehives to California for the pollination of almond trees. This type of commercial beekeeper moves thousands of bees around on trucks throughout North America, following the pollination seasons of various crops. As the documentary explains, the bees’ greatest value is not in honey or beeswax but in their pollination abilities, without which we would lose about a third of all fruits and vegetables. They then delve into the tragedy and possible causes of Colony Collapse Disorder, which is responsible for killing huge amounts of bees—over 30% of North American bees in just the past few years. However, even if the bees were healthy, another problem facing the industry is very demanding work for very low prices, so it is difficult to stay in business even under the best conditions. 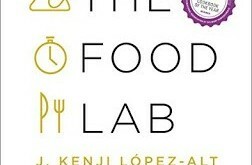 I liked how the filmmakers emphasize that our food doesn’t just come from the store; it has a long history before that, and sometimes we can forget that we are part of the food chain, too. With plenty of colour pictures, the authors promote treatment-free apiculture (the technical name for beekeeping) as a set of principles. They explain that our understanding of honeybees is ever-evolving and that the bees need help in order to continue their work. The book focuses on the urgency of small, personal solutions to big problems, recognizing that beekeeping is ultimately not about honey or profit but about survival—both of the bees and of humankind. 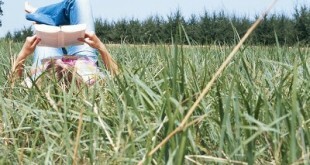 But I liked that it also highlights the principle that beekeeping should be fun. 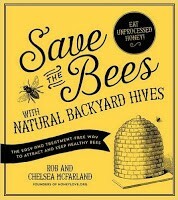 For those in a more urban environment, this book provides advice, checklists, guides to community resources, and lots of recipes from an urban apiarist. 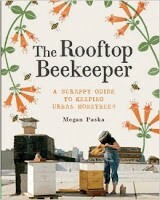 Living in Brooklyn, New York, the author notes that at first she was terrified of bees and didn’t realize their importance to the urban environment: “the concrete jungle is not exactly the backdrop one imagines as a honeybee heaven.” But she quickly overcame her fear and discovered that city bees actually have a great chance of thriving in big cities, and the rooftop beehives mostly go unnoticed by neighbours. If you want to know more about bees and beekeeping, check out the upcoming library program Beekeeping Basics on April 30!